April 2015 Gemini Horoscope predictions foretell that this is a month for personal upliftment and for achieving your goals independently. You have to put in the best efforts, and others will follow and help. Majority of the planets are placed in the upper half of your birth chart. Hence career and profession will be on top of the agenda. Domestic and emotional issues will take a back seat during the month. The Gemini monthly horoscope for 2015 April forecasts that you can expect major transformations in your professional life during the month. There will be considerable progress in your career. You will have the support of your family in your job or business. Overseas business trips and interaction with foreigners will be beneficial. Money will come from unexpected sources in April 2015. Career is a major source of fiscal happiness, particularly during the first two weeks of the month for the Twins. Also take a look at your 2015 Numerology Horoscope. 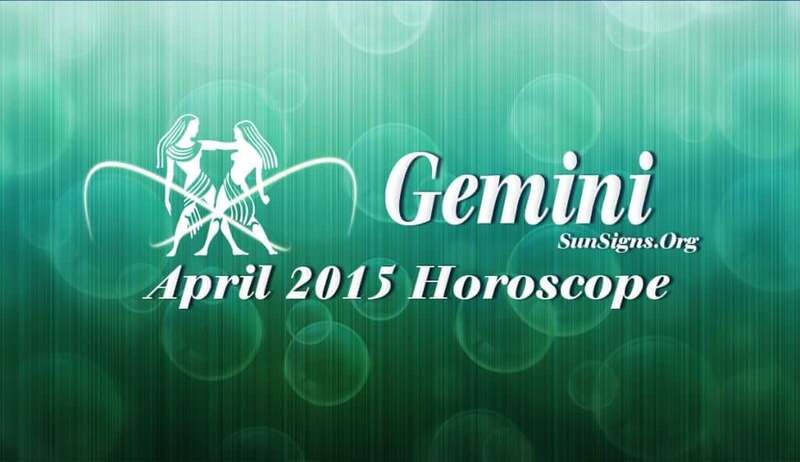 When it comes to love and romance in April 2015, present affairs will become stronger for the Gemini zodiac sign. There is abundance of love and it can be found in all places and all activities. You have the support of society, family circle and friends when pursuing you true love. You might suspect that your spouse is cheating on you, but this might not be true in all cases. Married couples might delay having a child. The Gemini horoscope April 2015 predictions forecast that health requires careful handling. Any any change in your fitness and diet routines should be made after proper scrutiny. Planet Saturn will help you to control overindulgence and will help you maintain your fitness. Thanks! This seems so appropriate right now!